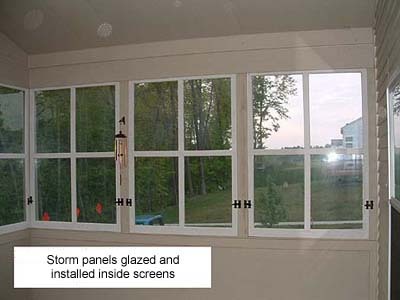 The Wood Window Surgeon can turn your screened porch into an all-weather porch by making custom insert panels to keep your porch warmer in cold weather. Inserts can be glass or Plexiglas. Even without a heater the "Solar Gain" will help save energy in the winter. If your porch faces South or West the solar gain will be even greater. With the addition of a space heater, your porch can be usable on all but the coldest days.